Design-build construction firm Ramtech Building Systems of Mansfield, Texas has announced that the company will unveil its new education market trade booth at the Texas Association of School Administrators Midwinter Conference being held at the Austin Convention Center January 29-30 in Austin, Texas. The new booth, and a custom designed video kiosk, will feature the company's relocatable portable classroom designs and two types of permanent modular construction for modular school buildings. Design-build construction firm Ramtech Building Systems of Mansfield, Texas has announced that the company will unveil its new education market trade booth at the Texas Association of School Administrators Midwinter Conference being held at the Austin Convention Center January 29-30 in Austin, Texas. The new booth, and a custom designed kiosk, will feature the company's relocatable portable classroom designs and two types of permanent modular construction for modular school buildings. The annual conference is expected to draw over 4,500 attendees including superintendents and other major decision makers representing over 950 public school districts and Education Service Centers throughout Texas. The exhibition schedule will begin on Monday, January 29 at 8:00 am. The TASA Midwinter Conference has become the most popular conference of the year for Texas school leaders, providing valuable opportunities for educators to come together to share innovative practices, network with peers, and gain fresh insights. The conference is organized around General, Thought Leader, and Concurrent sessions that focus on topics including school leadership, student engagement, finance, human resource management, digital learning, facility planning, operations, and assessment and accountability. The three general session keynote speakers are Chip Heath, professor at the Stanford Graduate School of Business, Texas Commissioner of Education Mike Morath, and Dr. Peter DeWitt, a syndicated writer and former blogger for Education Week's Finding Common Ground. 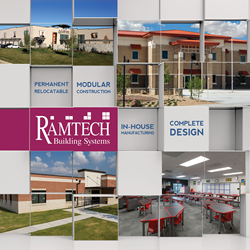 In addition to displaying their standard relocatable and permanent modular building products, Ramtech will also feature its Slab-on-Grade Permanent Modular Construction approach. This turnkey method combines offsite manufacturing and on-site construction techniques in order to produce a building faster and with less design and construction costs than a completely site built structure.